Home repairs and construction gone wrong are among the country's five worst consumer complaints. 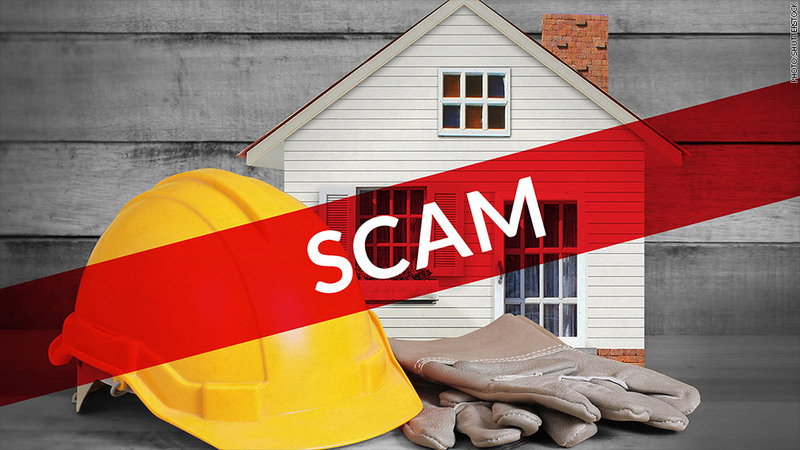 From "grandparent scams" to fraudulent investments, schemes targeting the elderly are by far the worst. That's according to an annual survey of 40 local and state consumer protection agencies that were asked to single out the most common and outrageous complaints they have received over the past year. Scammers went after the elderly in a variety of ways, whether it was a "once in a lifetime" chance to make money in Ghana's emerging gold market or a contractor who took thousands for a deposit but never came close to completing the work. "These con artists are very skillful at what they do and they will literally take the last dime of an older person's savings without any qualms whatsoever," said Susan Grant, director of consumer protection for the Consumer Federation of America which conducted the survey. Other awful consumer gripes included home repairs gone wrong and businesses that shutdown leaving consumers out of luck. Agencies chose their worst complaints based on the number of consumers and dollar amounts involved, the vulnerability of the consumers or the plain "outrageousness" of the situations. 1. Scams against the elderly: Frauds targeting seniors are especially egregious since they often take advantage of people "who may not really be able to manage their affairs very well," Grant said. One elderly man lost more than $25,000 after responding to an offer for a "once in a lifetime chance" to invest in Ghana's emerging gold market, according to one example from the Massachusetts Attorney General's Office. In another common scheme known as "grandparent scams," fraudsters pose as a grandchild or other family member in distress. A Pennsylvania woman, for example, almost wired $3,500 after receiving a call from a man claiming to be her grandson in California and begging her for money to get out of jail. While she sent her husband to the bank, she called a consumer agency for advice and did not make the money transfer. 2. Home improvement and construction: When renovations or repairs go wrong, it can take a serious financial -- and emotional -- toll, Grant said. In Florida, for example, one contractor falsely told a 92-year-old woman that another contractor had used his company's materials on her roof and that he needed to inspect it. He then claimed she had a leaky roof that needed immediate attention and eventually convinced her to pay more than $20,000 for repairs, much of which was unnecessary or extremely overpriced, according to the report. 3. Business closings: When a company suddenly goes out of business, its customers are often left in the lurch. In Connecticut, business closings were the fastest growing complaint. The worst involved an oil company that filed for bankruptcy, leaving hundreds of consumers without oil they had prepaid for. Those who had paid in cash lost an average of $2,500. 4. Phony sweepstakes and lotteries: Sweepstakes scams -- where callers claim you've won a huge sum but you need to send a small fee to obtain the cash -- just won't go away. In North Dakota, for example, one man was contacted by several foreign callers who told him he had won millions in prizes. He sent close to $9,000 in an effort to claim his phony prizes, which were irretrievable since he sent the funds via money transfer services. 5. Landlord/tenant disputes: Whether it's over mold or a leaky roof, a dispute with a landlord can "directly affect" a consumer's life, Grant said. One single mother in South Carolina was forced to move out of her home after mold from a leaky ceiling caused sinus and other health issues for her children. Meanwhile in Maryland, a woman was charged a "holding fee" to secure an apartment undergoing renovations. When it wasn't ready as promised, the landlord refused to return her money -- that is, until the Maryland Attorney General's Office stepped in.